Bartek Ciszewski: How is Lemonfrog doing now? Tino Wendland: We are not a startup anymore. We have been operating for ten years now. We have never had an investor, and we have been growing organically, financing the development of our platform with our own money. I started Lemonfrog as a side project. After two years, I realized that it was not possible anymore. I quit my other job and dedicated all my time to running the company for a very low salary in the beginning. Finally, we came to a point where I could hire more people. First, I was working for three years with a Swiss software development company. The chief problem was they were too expensive. That's why in 2014, I started looking for another remote team. Tino: I did some online research. I was looking for a remote Ruby on Rails team. There were three Polish and one Hungarian company on my shortlist. I took into consideration the price, their size, and the overall impression. Netguru looked the most professional and had the biggest team. Bartek: What were the biggest challenges? Tino: It worked quite well. In the beginning, I was surprised how opinionated Netguru team were. They were very confident from the get go. Netguru team knew very well what the development process should look like: the ownership of repositories, the communication, etc. It was quite unusual for me. It's a mindset they share with the creators of Ruby on Rails. Since I agreed with most of Netguru's procedures, I accepted their way of doing things, and in the long run, it turned out to be very effective. I started with one Netguru developer. It was the first time I was working with a 100-percent remote team. I had worked with a team from India in my previous job, but they had their representatives in our office. With Netguru, it wasn't a problem at all since I had daily contact with each team member: PM, quality assurance specialist and developer. Netguru also did my product review. We did some refactoring of the old code. It was the first time I could afford it. Earlier, I was focused on revenue, not code quality. Bartek: How did it start? What was the biggest challenge in creating such a tool? 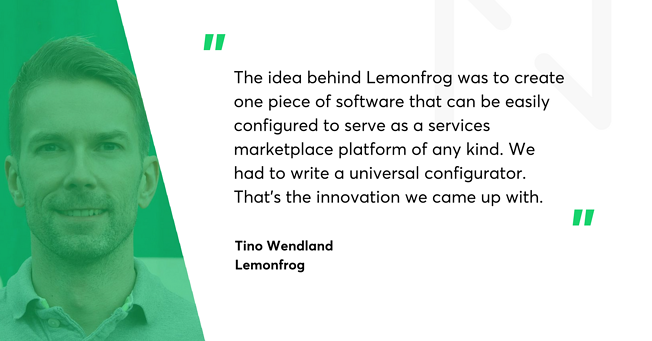 Tino: The idea behind Lemonfrog was to create one piece of software that can be easily configured to serve as a services marketplace platform of any kind. We had to write a universal configurator. That's the innovation we came up with. Every kind of business model that matches a client with a service provider could work on this platform. At the moment we are running 11 different marketplaces: i.e. Babysitting24, Petsitting24, Homeservice24, Tutor24 or Seniorservice24. Our software makes it very easy to create a customized tool for every kind of service. Then we just have to market it efficiently. We operate in Switzerland, Austria and Germany. Bartek: Why did you choose Ruby on Rails? Tino: I worked in Java enterprise software development. Programming in Java is complex and time-consuming. I was looking for something more efficient and simpler, since I was working on Lemonfrog in my free time in the beginning. I found RoR and it was fun to work with it. One framework from the client to the database. Looking back, I would still choose RoR. Bartek: Do you plan to expand your remote team? Tino: In just two years, it grew from one to four developers. Now, I don't think I can manage more myself. Their capacity is almost too much for me. This month, we had one more developer than usually, and it proved to be overwhelming for me to manage such a big team. One day, when we expand the project, we'll have to find one more manager here, in our office. Tino: I appreciate the professional attitude, the skills of the developers, excellent project management and quality assurance. It's definitely good value for money. What's even more important I appreciate the Netguru people I work with. They are an integral part of our team. They have a good process, good business model, and maybe that's why they are very motivated. Bartek: Any advice for people looking for remote development teams? Tino: First, you should know what you need. Is it just development or a complete team with a PM and QA specialist? I chose the latter, and it worked out very well. I'd also recommend working with big companies like Netguru. It's much easier to scale up, and you don't have to look for another contractor if you need additional services, such as design. Second, once you actually start working together, it's always good to meet in person. Even if the work runs smoothly. Meet each other in person at least once, have a beer and talk. This creates a human-to-human relationship that can easily develop remotely. It's very important.